In San Fernando Valley where according to the 1990 U.S. census figures, the number of Filipinos has tripled to 26,927 about 20 years ago, one is assured of a Simbang Gabi any day of the week leading to Christmas. Some masses are held at break of dawn in some parishes and in others, in the evening after work. It is usually followed by a feast of sumptuous Filipino dinner. Soriano’s parish for more than 20 years has joined about two dozen churches in the area in making Simbang Gabi not exclusively a Filipino tradition but one generously shared with the rest of the diverse communities. On Saturday December 21, Simbang Gabi opened at St. Jane parish where Filipinos are said to comprise 65 percent of churchgoers. 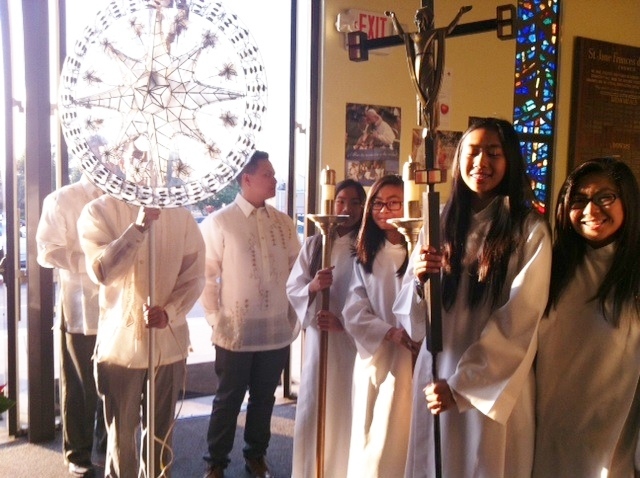 There was a procession of the star-shaped Christmas lantern or “parol,” blessed the week before by Archbishop Jose Gomez at the Cathedral of Los Angeles with those of other Filipino organizations around the city. Troops of Filipino families, many of them wearing elegant “barongs,” listened to the homily by Fr. Kevin Laffey not only about the Nativity but also about the significance of the “parol” as the center stage of the festivities. He said the Philippine “parol” is to Filipinos a symbol of hope, as the statue of the “Posadas” (Mary and Joseph looking for an inn for the night) is to the Hispanic community. Fr. Laffey paused to remember the victims of Haiyan and their families and reminded the community to help in any way they can amid the celebration away from the country. While the entire event may be a traditional commemoration, it does play a cultural significance with many in the younger generation. “It’s fun to grow up keeping with my mom’s tradition even though I’m no longer with this school,” said Myra Ramos who is now in college but comes back for Simbang Gabi. She associates good Filipino food such as ‘lumpia’ and ‘pancit’ with the religious offering. In the meantime Jonathan Soriano, who has directed the choir for 16 years, reiterated how much his musical interests are closely tied into the Simbang Gabi. He said St. Jane must have celebrated Simbang Gabi for more than 20 years. “I feel very involved with the songs of ‘Simbang Gabi’ when they are sung. As I research and select songs for the year’s repertoire, I have to do a little more studying because I have to learn and understand the translations of the Tagalog lyrics. That is where I develop a deeper meaning of the music. And it is not just limited to the lyrics but also in learning about the composers and the era when their music was written,” he told this reporter. 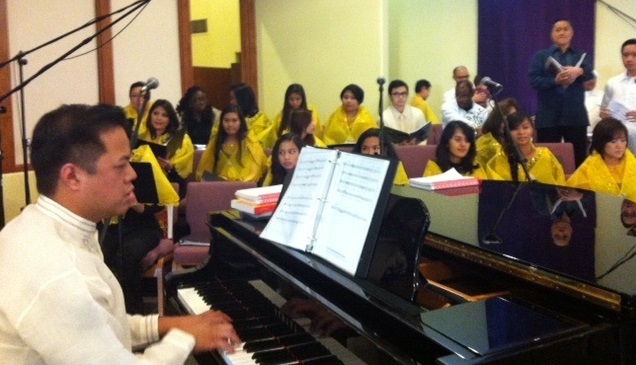 He said the younger members of the choir have enjoyed the cultural bridge offered by a bilingual English-Tagalog mass. She added how she has also reached out to folks outside of the choir to join in the celebration. Together with co-chair Arlene Zapanta and committee members, the group has been raising funds to support the novena and the dinner. 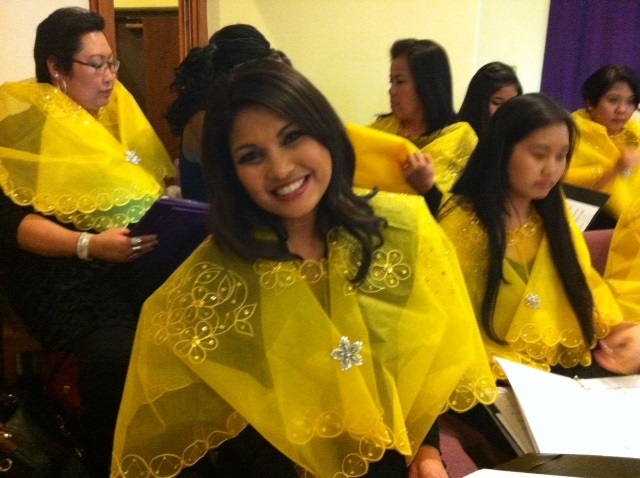 One of the cantors, Tess Ventura, has been singing for Simbang Gabi since the age of 8, while still in the Philippines, and now has been with the St. Jane choir for 10 years. “The lyrics are usually in Tagalog and our parish may not know the language. But praying through the song unites us with the non-Filipinos. It seems that our churchgoers have embraced this tradition as part of their faith,” she said. This article was also published in Inquirer.net, a content partner of The FilAm Los Angeles. Cantor Tess Ventura has been singing for Simbang Gabi masses since she was 8.